Gabriel Halia from Pawale village in Samberigi, Southern Highlands is responsible for the upkeep of equipment at the Oil Search Agogo Processing Facility in his role as oil field Mechanic. The journey he took to reach that level is one of humility, courage and determination. Gabriel began as a Roustabout with Chevron Niugini in 2001 after completing grade 10. "I started off cutting grass and removing rubbish within the Gobe Processing Facility. One of my other tasks involved removing sand from the Production Separators using a shovel," he recalls. He performed all his tasks quite diligently and in 2005 he was moved to the Maintenance department to become a general Trade Assistant. "There, I was responsible for cleaning tools, keeping equipment in order and topping up fuel on generators." In 2006, he decided to take advantage of the learning opportunities provided by Oil Search after the Company took over operatorship from Chevron in 2003. "I upgraded my grade 10 marks in 2006 and was able to go on to complete my grades 11 and 12 through the Oil Search sponsored Department of Open and Distance Learning (DODL) program, affiliated with the PNG University of Technology. 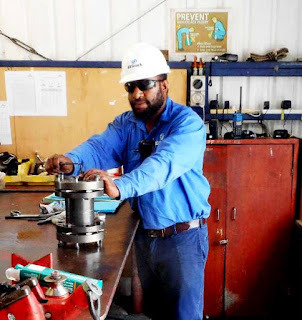 "In 2008, I was moved to the Mechanical Workshop in Kutubu where I became a Trade Assistant Mechanic and it was there that my level of interest grew in that particular trade," added Gabriel. His job involved reading manuals, identifying correct tools and their uses, reading scales on precision measuring tools, undergoing basic in-house training, attending mandatory courses and working closely with the tradesmen on various tasks. A year later, Gabriel was presented his grade 12 certificate by the Oil Search Training department and that opened up a new window of opportunity for him. "All my hard work and dedication from when I first started as a roustabout and a trade assistant finally paid off when my immediate supervisors from the Machine Shop or Maintenance department made a recommendation for me to join the Apprenticeship Programme in 2012. "Of course I had my doubts because I never attended a Technical College. All I had was my 11 years of experience doing general house-keeping in the various processing facilities. I had so many questions. The main one being; will I ever complete this Programme?" The few weeks and months that followed were indeed challenging for Gabriel but he began to understand the material thanks to the Oil Search Training team and his ever helpful colleagues. "It was never easy. My main challenge was interpreting engineering drawings which my colleagues really helped me with and along with the theory and practical sessions conducted by the Training department. Following a series of block courses at the Tabubil Star Mountains Training Institute and the Port Moresby Technical College (POMTECH) from 2013 to 2016, Gabriel made it to the final year of the programme. "Finally in June 2016, I went for my third extension block course at POMTECH. This was the decider course whether to re-sit the following year or to pass and receive your National Trades Certificate. It was all up to me now. I gave my very best and I passed. The journey I took had come to end and I was now a tradesman! "I was offered the position of Oil Field Mechanic based at the Agogo Processing Facility (APF) that same year. I never thought I would see this day but through Oil Search's faith and confidence in me, I am now a certified Mechanic," said Gabriel. Some examples of the work he performs include repairing of Crude Transfer Pumps, Gas Cooler Fans, Diesel Engine Driven Pumps, Valves and Compressors. "I am really proud of my achievements especially since I come from the local area. I would like to thank Oil Search for providing me with this opportunity." Gabriel's advice to those with big dreams: "Have pride in the work you do, regardless of its size. There is always a light at the end of every tunnel so never give up."